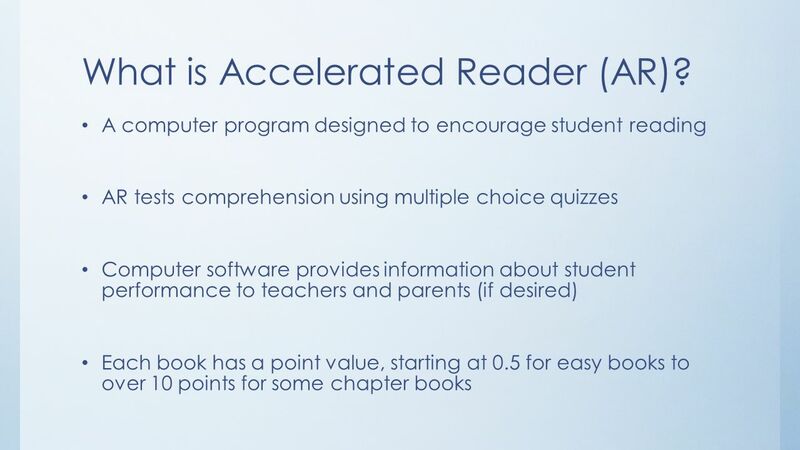 2 What is Accelerated Reader (AR)? 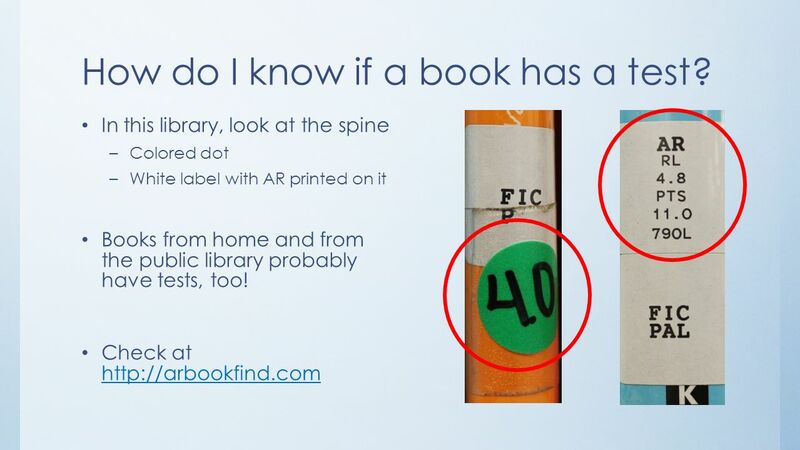 4 How do I know if a book has a test? 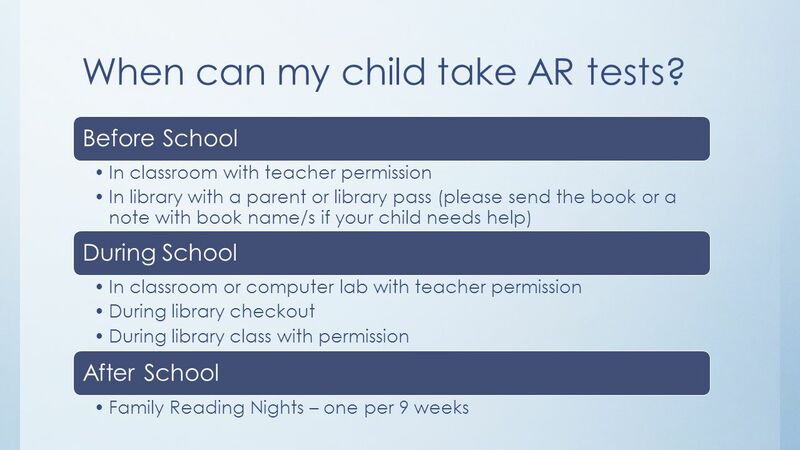 5 When can my child take AR tests? 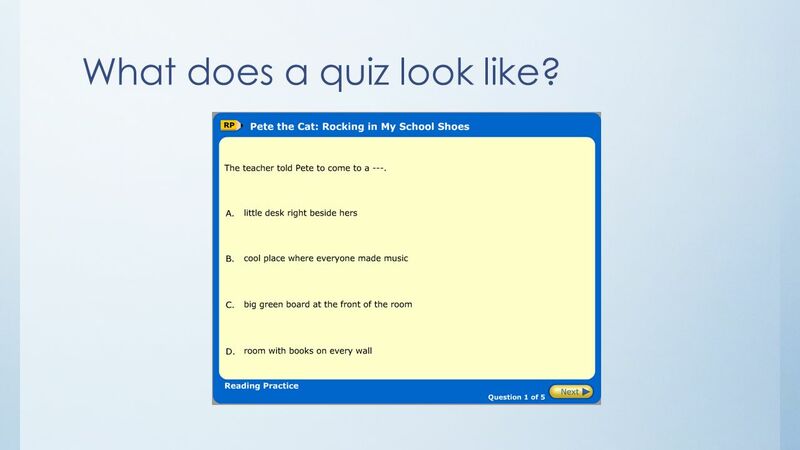 6 What does a quiz look like? 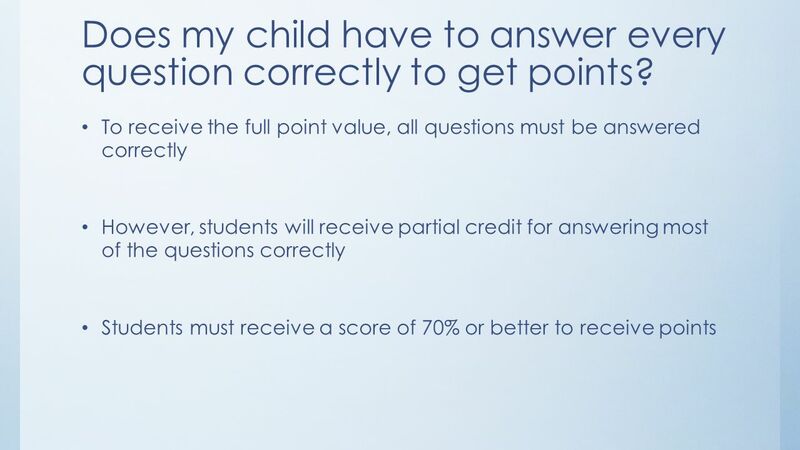 7 Does my child have to answer every question correctly to get points? 8 Is it OK to help my child? Reading together is always encouraged! 1. Students may not take tests on books more than 2 levels below grade level. For example, a 4th grader may not test on a 1st grade book. 2. You must read the entire book before taking a test on it. Primary students should read easy books at least twice. 3. 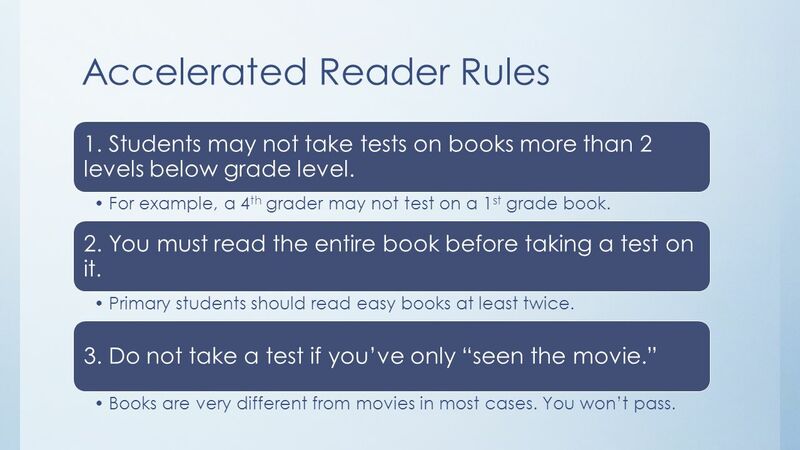 Do not take a test if you’ve only “seen the movie.” Books are very different from movies in most cases. You won’t pass. 4. 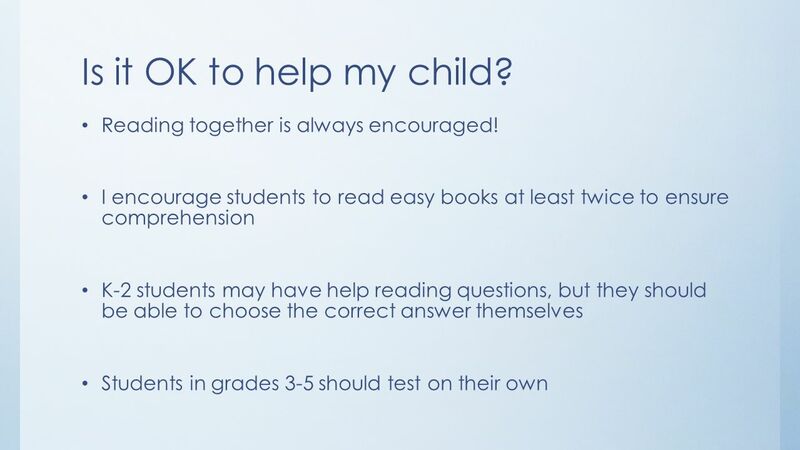 Do not help other students with tests or share answers. This is cheating. Both students’ tests will be deleted. 5. No talking to other students while testing. It will be assumed that you’re sharing answers. 6. Tests may only be taken in the library, in the computer lab, or in the classroom with your teacher’s permission. You should always be under adult supervision while testing. 11 What happens if my child reaches his/her goal? 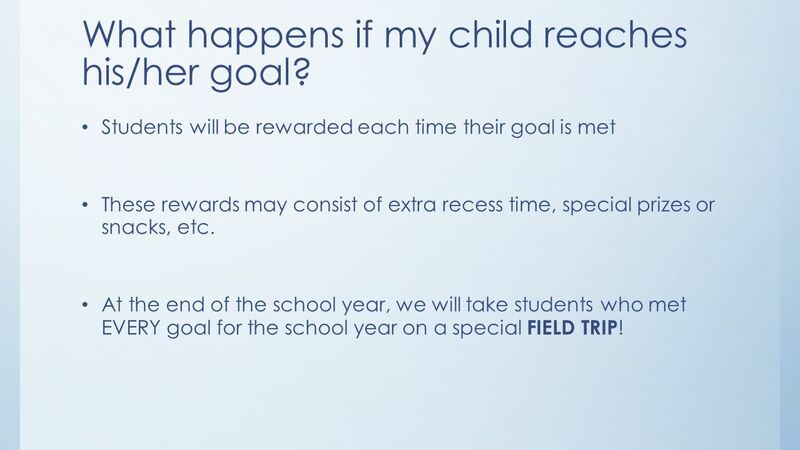 Students will be rewarded each time their goal is met These rewards may consist of extra recess time, special prizes or snacks, etc. At the end of the school year, we will take students who met EVERY goal for the school year on a special FIELD TRIP! 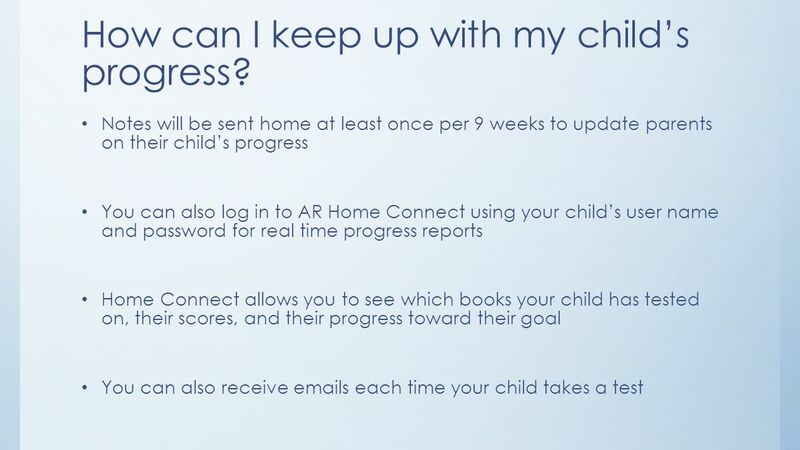 12 How can I keep up with my child’s progress? 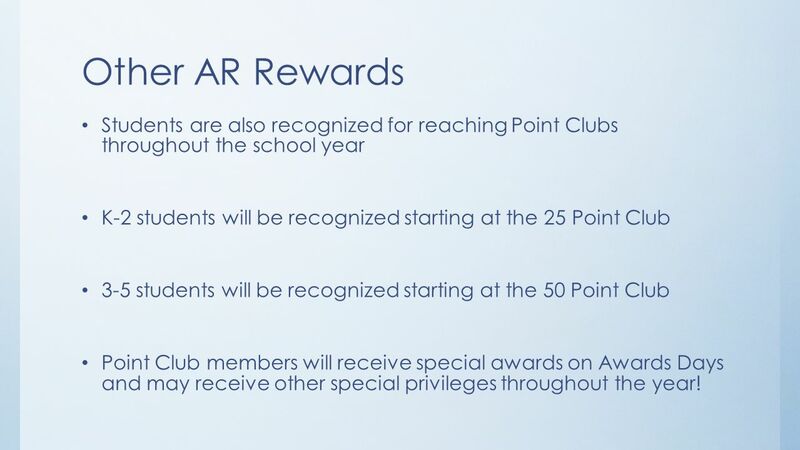 13 Other AR Rewards Students are also recognized for reaching Point Clubs throughout the school year K-2 students will be recognized starting at the 25 Point Club 3-5 students will be recognized starting at the 50 Point Club Point Club members will receive special awards on Awards Days and may receive other special privileges throughout the year! 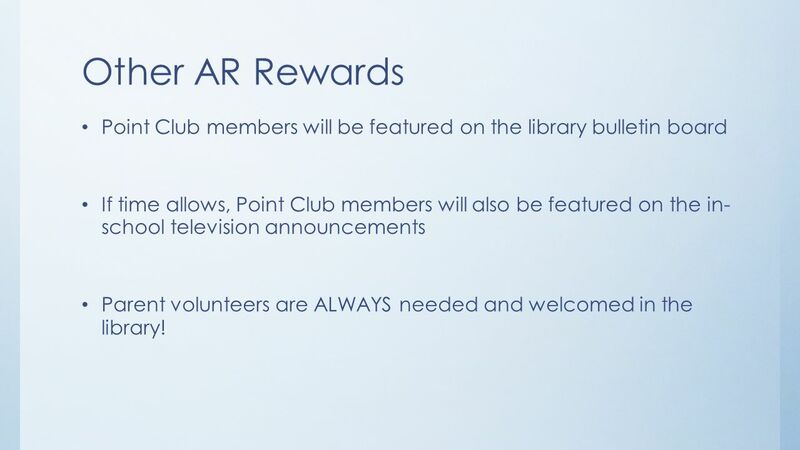 14 Other AR Rewards Point Club members will be featured on the library bulletin board If time allows, Point Club members will also be featured on the in- school television announcements Parent volunteers are ALWAYS needed and welcomed in the library! 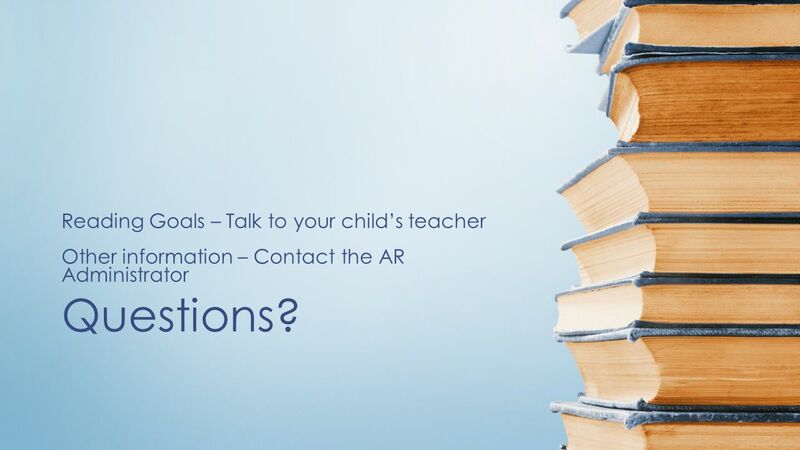 Other information – Contact the AR Administrator Questions? 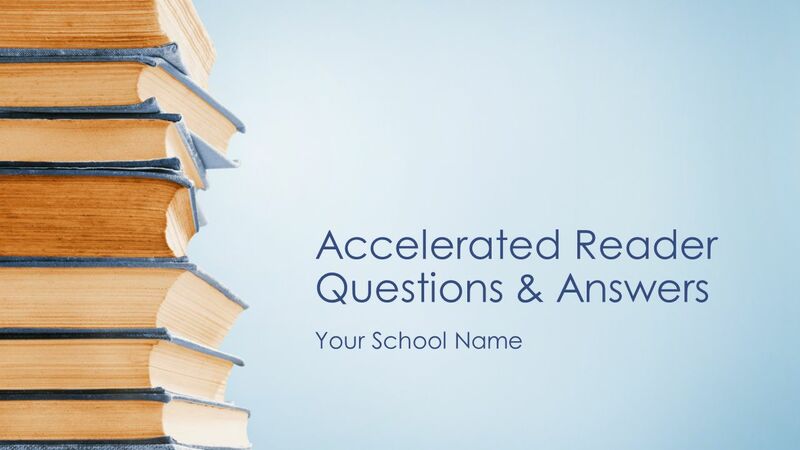 Download ppt "Accelerated Reader Questions & Answers"
Accelerated Reader® 101 for Parents Everything you wanted to know and more! 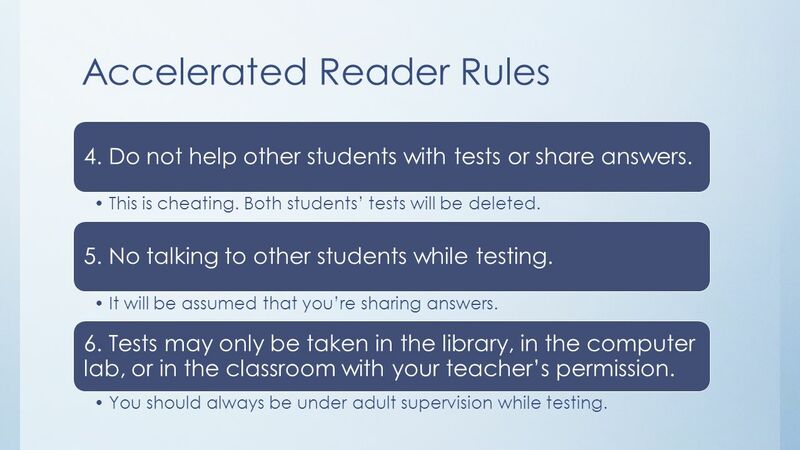 Accelerated Reader 101. 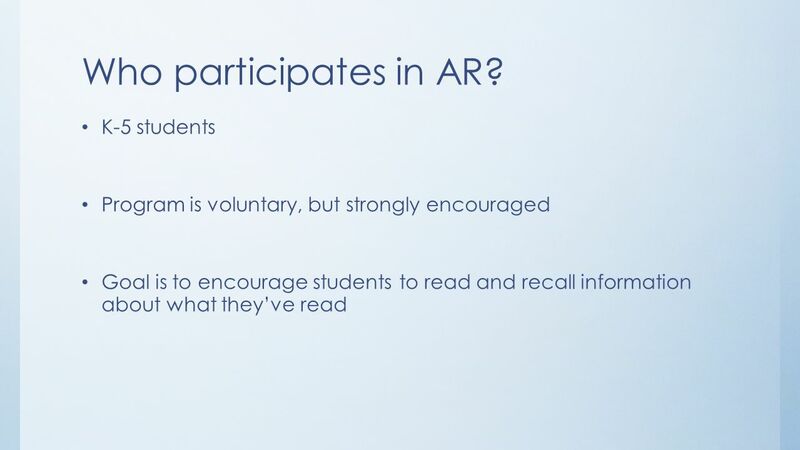 AR is - a computer-based program designed to increase reading comprehension through daily monitoring using trade books. Welcome to Curriculum Night. Where do I find all of the important information? My website The District Website. 6 th Grade: Mrs. Larson.  Respect  Responsibility  Kindness  Integrity. Accelerated Reader A Windermere Elementary PTA Program Thank you to all the parents who volunteer their time to help make the Accelerated Reader Program. Accelerated Reader at Lincoln Elementary School Karin Woodruff 2007.  Welcome to Second Grade Curriculum Night. Family Information System Staff Directory Amy Clark On my classroom website, you will. Accelerated Reader at Starcross Primary School What is Accelerated Reader? How does it work? How can I help my child? Accelerated Reader Questions and Answers For Parents. Accelerated Reader A Pierce PTSA program Thank you to all the parents who volunteer their time to help make the Accelerated Reader Program a. Accelerated Reader Program Presented by Douglas County Schools Adapted by Linda J. Tiller ASES Media Specialist. Accelerated Reader An Introduction Presented by Wyndi Evans and Jamie Evans September 20, 2007. Rainbow Elementary School Accelerated Reader Program. Central Primary Third Grade Welcome, parents!. Welcome Back!